Quick Spin: The International CV Series - Minuteman Trucks, Inc. The mood was decidedly upbeat among International executives at the truck-builder’s launch of the new, medium-duty CV Series Nov. 7. There is a definite sense that this company has weathered the worst and is starting a new chapter in terms of products and technology. And nothing better signifies this new outlook than the CV Series, which was developed jointly with General Motors and has a distinctly different feel from past International medium-duty offerings. Looking at the new truck head-on, you’re first struck by the bold and ample chrome grill, which is reminiscent of classic 1950s automotive styling. It’s a good look. Not only is it attention-grabbing, but it also conveys a tough, aggressive demeanor that is likely to appeal to this truck’s target customer base. From the side, you can see the strong family resemblance to GM’s Sierra and Chevy Silverado truck models. That makes perfect sense, because the CV Series features GM’s medium-duty truck cab and the Isuzu-designed International 6.6L diesel engine. 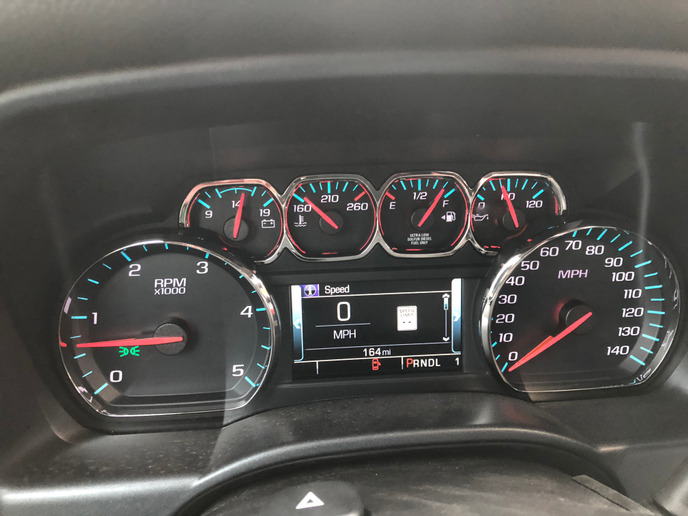 The CV Series instrument cluster will be instantly recognizable to Chevy Sliverado or GM Sierra fans, and features crisp graphics and brilliant backlighting. Slide in behind the steering wheel on a new CV Series truck, and you’re immediately right at home if you’re a fan of Silverado and Sierra cabs and interiors. My test model was loaded with creature comforts, including a tilt steering wheel with infotainment system controls on it as well as power seats, windows and mirrors. 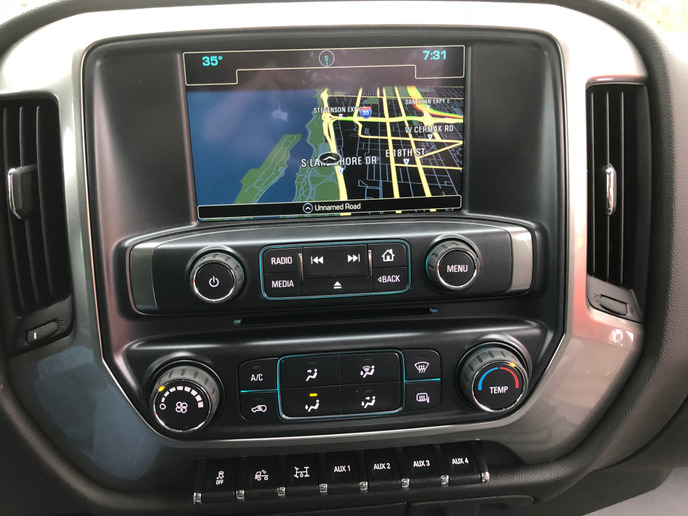 The instrumentation is pure General Motors — with bold graphics, crisp illumination, and instruments laid out for quick, easy, scans by the driver. The large, colorful, center-dash infotainment center is bit odd to see in an International vocational truck. But, as Gilligan told me, buyers now expect these systems in any truck they buy, and there was no way International wasn’t going to take advantage of having such a powerful, easy-to-use tool in its trucks. “Put your foot in it,” Gilligan told me from the passenger seat when we were ready to roll. I did, and was immediately pushed firmly back into my seat as the powerful, 350-hp 6.6L diesel roared to life. Throttle response was crisp, and the Allison 1750 RDS automatic transmission clicked through its gears without breaking a sweat. It’s worth noting how quiet midrange diesel engines have become over the past decade, and the International 6.6 doesn’t disappoint on that front. Put your foot in it, and you’re rewarded with a throaty, rumbling roar that isn’t overwhelming and doesn’t have so much as a hint of the clatter that used to be standard on engines in this class. The CV Series gets seriously high marks for both its ride and handling characteristics as well. Gilligan said International engineers, working in concert with Meritor, fine-tuned the truck’s suspension to deliver a smooth ride with minimal lateral sway. He told me to crank the wheel aggressively back and forth at around 30 mph to get a good feel for how tight the suspension is, and he’s right: Even a Class 5 CV model has handling characteristics you’d expect to find on a 1500 series pickup truck. Another new interior feature on the International CV Series is the center dash-mounted Infotainment system. The official launch occurred in downtown Chicago during morning rush hour. So any sort of meaningful highway cruise was simply out of the question (although International is planning more comprehensive test drives and evaluations early next year). But even running on a closed course on a massive parking lot at Solider Field, it’s clear that International is determined to gain back the medium-duty ground it lost as it stabilized its finances and returned the company to profitability. The new CV Series is a fine indication of the course International is charting as refocuses on its core competencies and strengthens its relationships with its new global partners. In an era when both durability and luxury are expected as standard features on work trucks, International has stepped up and delivered a vehicle that takes advantage of the company’s 100-plus years of experience while charting a new course in terms of comfort and cutting-edge technology.